The Show at Chantilly take place over 3 days on Friday, July 15, Saturday, July 16 and Sunday, July 17, 2016. Show Hours are Friday 2 p.m.-8 p.m., Saturday 9 a.m.-5 p.m. and Sunday 10 a.m.-4 p.m. Please check this link for photo op rules and how autograph items are categorized such as small flats, large flats, premium items, etc. For example, baseballs are considered to be a small flat. Photo Ops are taken by a professional photographer. Jerome Bettis is a retired running back for the Pittsburgh Steelers and a Superbowl Winner and current broadcaster. He is considered one of the best big backs of his era and was an integral part of the Pittsburgh Steelers winning Super Bowl XL in 2006. Bettis was picked in the first round (10th overall) of the 1993 NFL draft by the-then Los Angeles Rams. A star even in his rookie year, he rushed for 1,429 yards and was named Offensive Rookie of the Year. Bettis retired after 13 seasons as the NFL’s fifth leading all-time rusher with 13,662 yards and 91 touchdowns. He was a six-time Pro Bowl selection. He also won the NFL Comeback Player of the Year award in 1996 and, in 2002, he was the recipient of the Walter Payton Man of the Year Award. PFP Sports & Celebrity Talent Agency is a top booking agent for motivational sports speakers and celebrities. 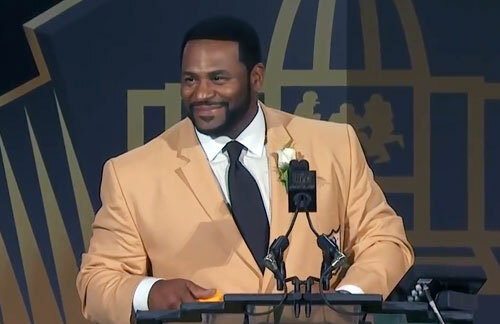 If you would like to book NFL stars like Jerome Bettis for a speaking engagement, personal appearance or special event, you can request Jerome Bettis agent and speaker information from PFP Sports & Celebrity Talent or call 800.966.1380.